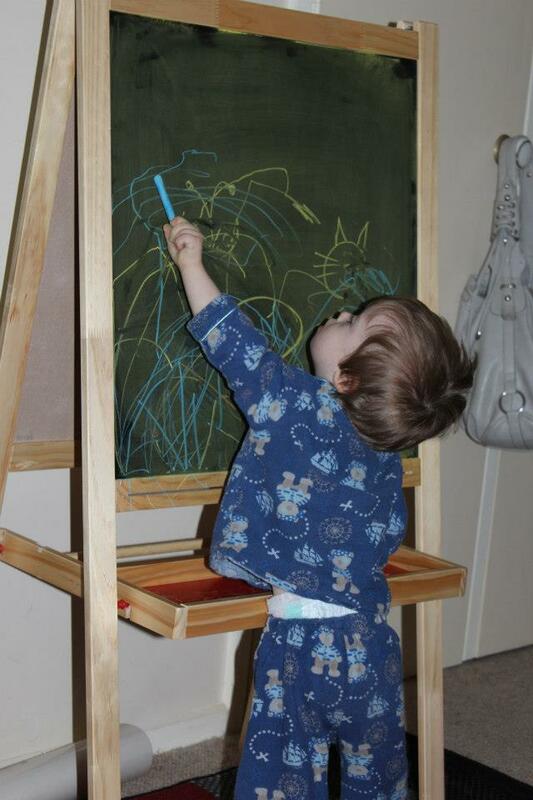 While we were in the city, we bought Felix a chalkboard. 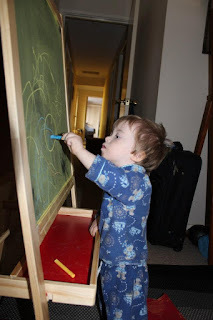 He really likes drawing but, taking our eyes off him when he's using crayons or pencils, can be disastrous. He quite likes to chew on crayons, and pencils will draw on all kinds of paper, including that which isn't meant to be drawn on. Chalk is a fantastic alternative and means that even if he draws on other things, it's really easy to wash off. When I set up the chalk board today, Felix was really excited. He has recently learnt to draw circles, something we've been working on with a drawing app on the ipad. He's really good at them now and will draw one if we ask him to. Other than that, he draws butterflies. Of course, they look nothing like butterflies yet; he is only two years old, but he tells us they are butterflies. He will often look up from what he has drawn, and sign 'butterfly', and today was no exception. He drew lots of 'butterflies' on the chalk board and, very proudly told us all about them. 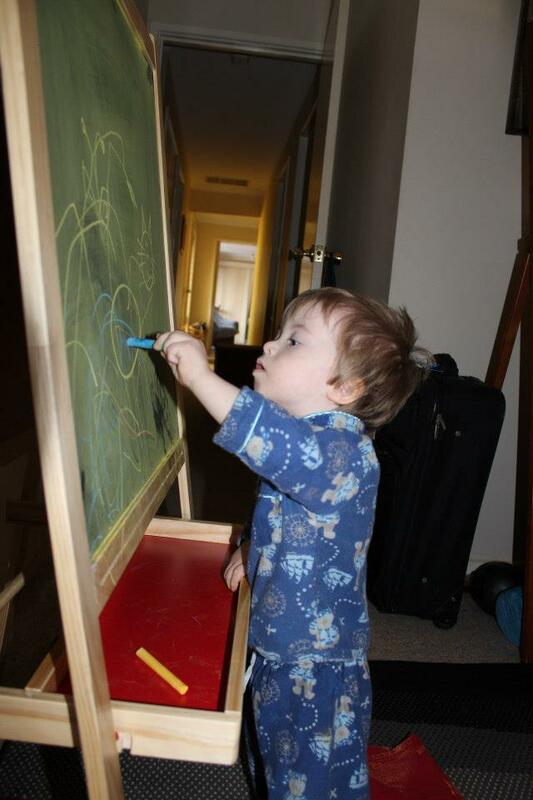 One of the reasons we bought a chalkboard was because Felix's Occupational Therapist suggested finding activities for him to strengthen his upper body. She told us to encourage climbing, which isn't a problem because it's become one of Felix's favourite things to do. She also suggested encouraging any activities which involve him having to raise his arms above his head. The chalkboard is a great tool to encourage that motion, because Felix really likes covering the whole board with his drawings, meaning he has to stretch up high to draw at the top of it. He was balancing on tippy toes today, reaching up as high as he could. We're still a little bit concerned about Felix's health. He felt really warm again a couple of days ago, but it only lasted for a few hours and then he seemed fine again. His appetite has dwindled again for some reason. It's hard to know whether that's because he's a two year old who is too busy to eat, or if it's because he doesn't feel well. That would have to be the most difficult thing about Felix not being able to talk yet. He can't tell us when something is wrong, so we have to watch him extra carefully. 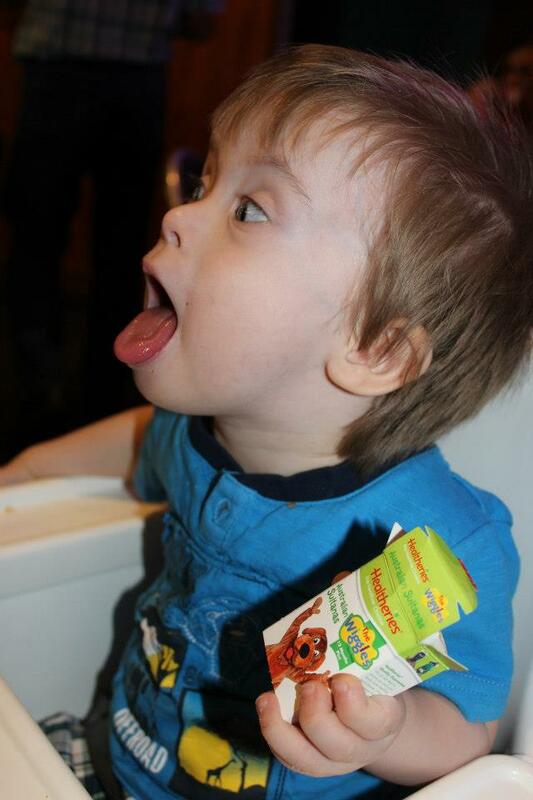 Tonight he refused to eat any dinner and was quite upset at bed time, which is very unusual. When we went to check on him, we found him asleep on the floor. He has just finished the antibiotics for his ear infection, and we're about to start some drops to try and clear the wax in his ears. Hopefully the Doctor will have a better chance to see if his grommets are still in his ears or not. I just realised it's been twelve months since I started writing my blog. Thank you to everyone who has stopped by for a read, and for all the wonderfully encouraging messages from so many of you. I have had the opportunity, through my blog, to talk to Mum's who have been given a prenatal diagnosis of Down Syndrome. I've met new friends, who also have kids with Down Syndrome, and I've felt privileged to be asked lots of questions by people who want to educate themselves about Down Syndrome. Over the past year, my blog has been visited over 24,700 times by people from all over the world, which is really exciting considering I didn't think anyone would be interested in reading my ramblings. Thank you so much. It has been rewarding for me to be able to put my thoughts down, and to be able to share Felix's life with you. There have been good times and bad times over the past year but, one thing remains the same; Felix continues to bring us so much joy and we are thankful, every day, to have him in our lives. Happy blog birthday;) and thanks for sharing your life & Felix.